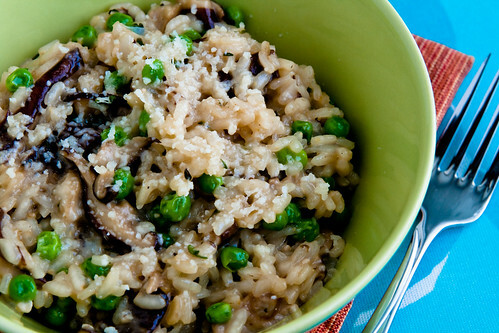 Another Cooking Light recipe I tried last week was the Shiitake and Sweet Pea Risotto. This was my first attempt at risotto and I really didn't know what to expect, but Cooking Light promised the recipe would be "easy" and "impressive" so I thought I'd give it a try. And I'm glad to report that Cooking Light wasn't lying! The recipe really isn't complicated at all, only a little "high maintenance" as the broth has to be added to the risotto half a cup at a time and it has to be stirred constantly, but it is certainly not difficult to do. And the end result was fabulous. While I stuck with chicken broth this time around, it is certainly easy enough to make this a vegetarian dish by substituting vegetable broth instead (hence I'm filing this one under "vegetarian.") I think this has just become one of my new favorite recipes!